Three new energy research initiatives recently got a collective 1.2 billion Euros from the European Union. Among the beneficiaries is Risø DTU, at the Technical University of Denmark, whose laser-enabled “WindScanner” takes wind power measurement to a whole new level. Shooting laser beams into the air seems weirdly aggressive in the context of gently spinning wind turbines, but the WindScanner turns out to be extremely helpful in mapping air conditions. One WindScanner consists of three white units called “Lidars” (after “Light Detection and Ranging”). 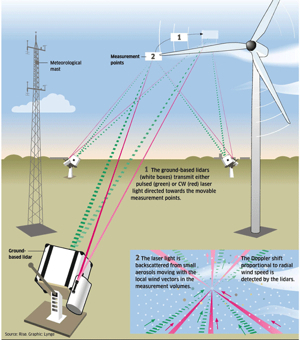 Laser beams emitted from the Lidars are backscattered as they encounter whirling aerosols in the air, enabling the Lidars to infer the wind’s motion and intensity. Check out the animation below, courtesy of the Risø DTU site. With three Lidars working together, the WindScanner can generate 3-D maps of wind conditions, helping wind farm operators to exploit wind energy with the highest efficiency. What previously would have taken a series of meteorological masts can now be determined with a suite of three Lidars, small enough to be packed into a van. So portable is the WindScanner that it doesn’t necessarily need to be part of a permanent installation at a wind farm; it can even be dispatched to help troubleshoot wind turbines that are underperforming, as a sort of diagnostic tool determining whether the turbine or the weather is ultimately at fault.